Eight years after it publicly pledged to become carbon neutral by 2020, American University achieved its goal—two years ahead of schedule. AU is the first carbon neutral university in the nation, as well as the first urban campus and the first research university to accomplish this achievement. To earn official designation as carbon neutral, AU had to meet guidelines set by Second Nature, a nonprofit dedicated to accelerating climate action in—and via—higher education. The strategy includes reducing energy use per square foot and producing renewable energy on campus, using green power, and purchasing strategic offsets. AU’s electricity is 100 percent renewable. Fifty percent comes from solar power panels at a solar farm in North Carolina. The site was the largest solar purchase installation by a non-utility company at construction in 2014. The remainder comes from renewable energy credits. AU’s carbon neutral campus is the result of a community-wide effort led by the Office of Sustainability, with significant contributions from Facilities Management and Transportation Programs. While the university worked toward its goal, faculty integrated sustainability into their classes. Students in an environmental studies course, for example, organized a waste audit and an urban ecosystem walk on and around campus to collect data on their local environment. Other students produced short films about campus waste practices and infrastructure, participated in zero-waste events, and joined in campus-wide competitions to reduce waste and the university’s carbon footprint. Staff contributed by participating in programs like Green Office, which promotes the adoption of sustainable practices and environmental responsibility by employees in their day-to-day work. After achieving this major milestone, the AU community looks forward to developing more innovative approaches to enhancing sustainability efforts. The university is currently undergoing a two-year hot water and heat conversion project that will drive down campus use of fossil fuels. Underground steam lines will be replaced with low-temperature hot water lines to meet campus heating needs. This new system will provide AU with reliable energy and carbon savings for the future. 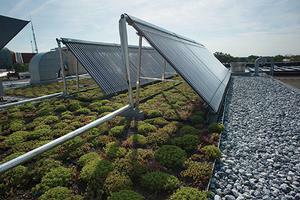 American University is proud to be a sustainability leader. Through our innovative approach to reducing emissions, using green power, and purchasing strategic carbon offsets, we achieved carbon neutrality two years ahead of schedule.